Doesn't this view of Seatle look like something from the future? I cut it, the wandering bug and the frog for a different page, but none of them worked there. I went upstairs and grabbed a few things off my table to throw together this page. I'm constantly amazed at how things fit together. I printed and cut out ~keri smith's 100 ideas to use as journal starters. This is the page that I put together to hold them. I glued about half of them to odd bits of paper, but I realized that gluing all of them would make them too bulky to fit into the envelope. That and I was getting too sleepy to continue. 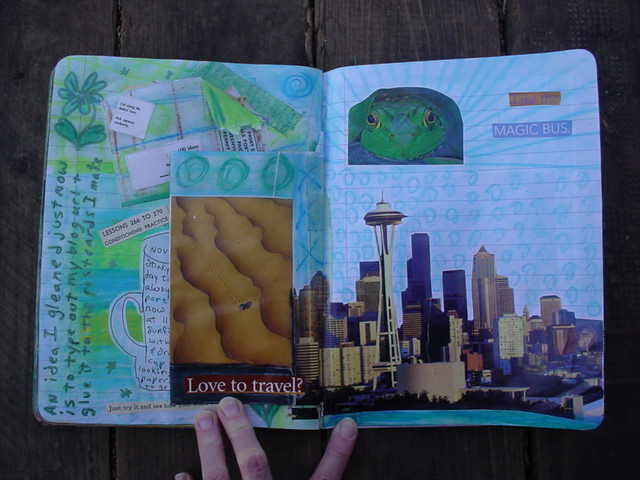 Dawn, I love how you used the envelope as a pocket in this spread. Very cool idea. I love recycling things. Also, I just wanted to tell you that I love the background images on the sides...are they from your journals? That is such a cool idea and I haven't seen that kind of thing anywhere else! Thanks Julie. 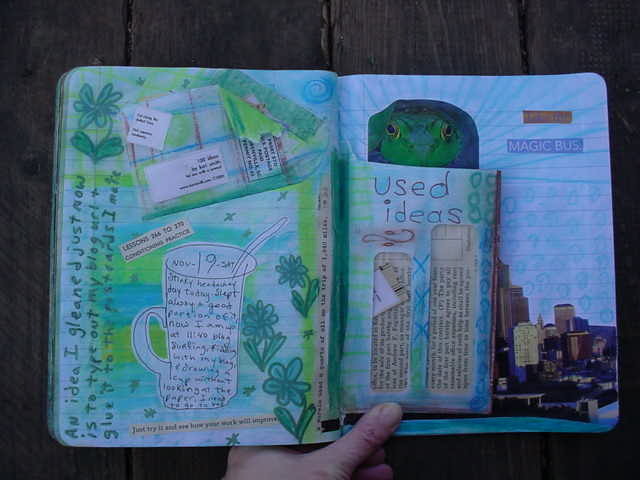 The background image on the sides is one of my pages that I did in Maya's journal. I had seen the new background on Kaliodiscopic Kris's blog and that gave me the idea that it could be changed. I looked at the source code and found that it pointed to a web URL for the image and figured I could switch it for one of my own. It worked. I meant to add that I was really tired of the old image and knowing lots of other people have it on their blogs too.